Congolese President Denis Sassou Nguessou arrives to cast his ballot in Brazzaville, Oct. 25, 2015. Opposition parties in Congo Brazzaville are rejecting the result of Sunday's constitutional referendum. Results show the referendum passing with 92 percent of votes, clearing the way for longtime president Denis Sassou Nguesso to run again in 2016. An alliance of opposition parties called FROCAD called for voters to boycott this referendum. It claims that nearly all of them did. FROCAD’s spokesman Guy Romain Kinfoussia disputes the official turnout figure of 72 percent. He claims the real turnout was more like three percent. “We reject the results,” he tells VOA. The opposition will ask Mr. Sassou Nguessou to withdraw this result and sit down for inclusive talks on holding elections in 2016, in which he will not be a candidate. Kinfoussia adds, "if Sassou does not agree the opposition will continue with civil disobedience." 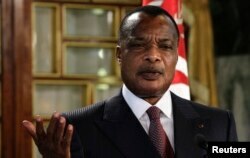 FILE - Congo's President Denis Sassou Nguesso speaks during a news conference. The European Union called last week for an inclusive dialogue in Congo Brazzaville as a matter of urgency. According to FROCAD, the voting process on Sunday was a sham. Kinfoussia says the government took groups of voters by bus to several different polling stations where they did not have to present voters cards. He also says people were paid to vote. Analyst Paul Melly, who follows Congo Brazzaville’s politics for the research organization Chatham House, says the result was in line with all the Republic of Congo’s polls since 2002. "Basically the government controls the electoral process very strongly," he said. "Most opponents know they are fighting a very unequal battle, and very many voters can not see any point in participating at all. So the official figures that have been announced are completely unsurprising. Anecdotal, on the ground evidence suggests that the turnout was very low in many places." One of Congo’s leading opposition politicians, Guy Brice Parfait Kolelas has been under house arrest with about 30 of his supporters since last Thursday. Kinfoussia says his group has asked the United Nations to negotiate Kolelas’ release, but Sassou has refused without explanation. Kolelas has complained he is running out of food as presidential guards surrounding his house have confiscated supplies.